I realized, though, that I was conjuring up projections of someone else’s idea of exotic: elephants, cows on the streets, beautiful beaches, etc. A brief reflection of “exotic” – originating in or characteristic of a distant foreign country – led to me to my answer. The California Zephyr is exotic. 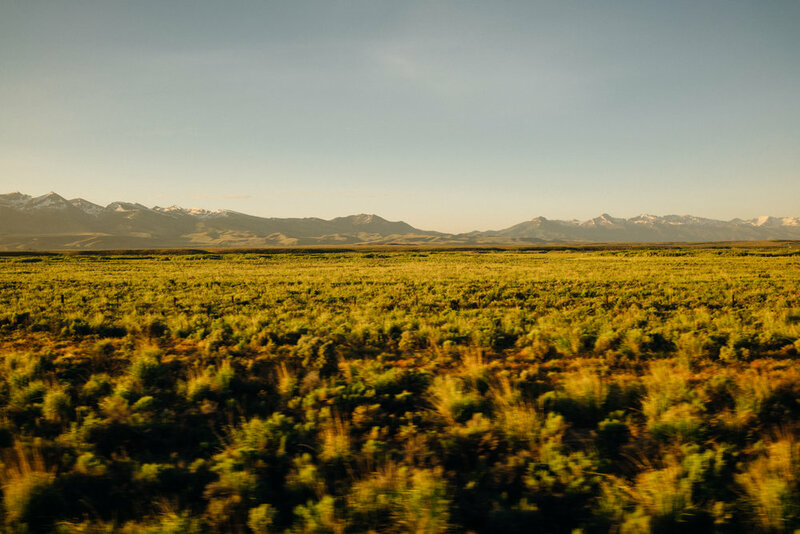 I have wanted to ride the California Zephyr for many years now, romanticizing the images of a train cutting through the Rockies and rolling through the Nevada desert, peacefully, while I’m reading through a delightful book and sipping coffee (or wine, depending on the time). 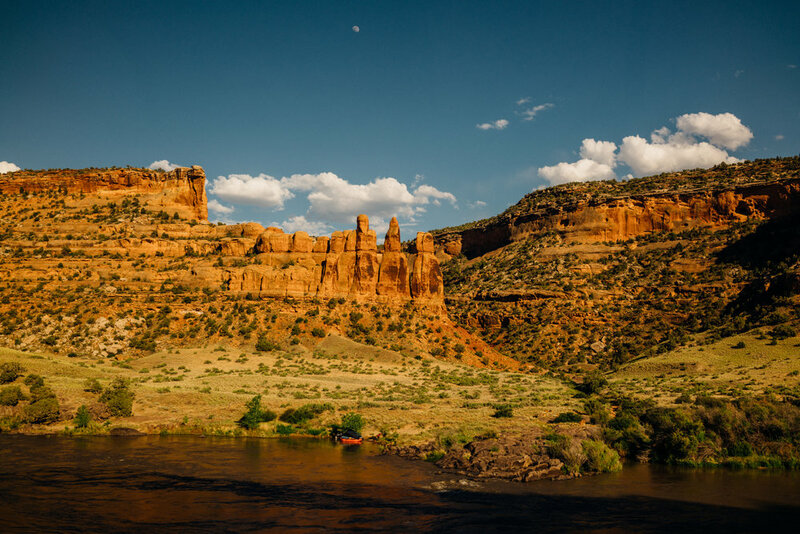 The reality of the California Zephyr, though, is at least slightly different: those romanticized vistas have to still be imagined because, of course, you are in the train and not on a helicopter panning over it. My train from Chicago to San Francisco (or Emeryville, to be precise) that was supposed to take 52 hours took 55 hours. 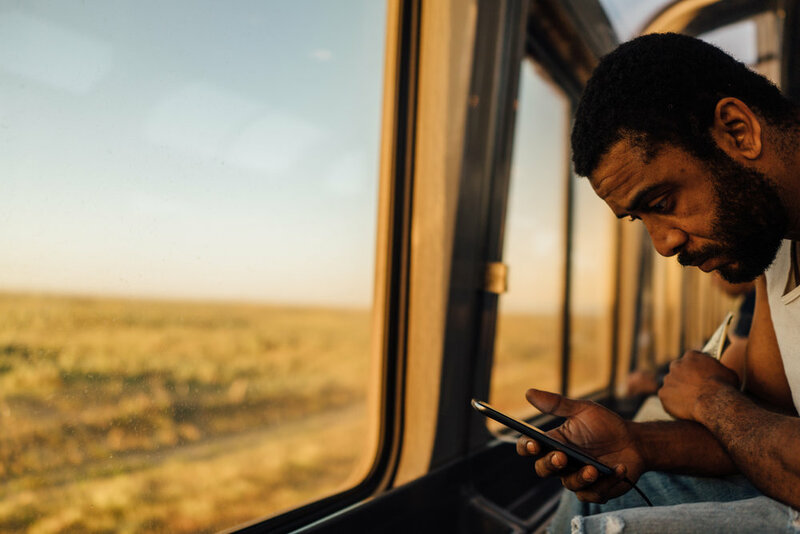 This is a makeshift society for over two days, with daily rituals, mealtimes, socializing, entertainment, nature calls – all in a shared environment that’s spatially constrained, where norms of privacy (for most of us in coach anyway) are different that what we are used to. My tribe within this society included Bob and Margaret, retirees from Newcastle, England, who would by now have been disappointed with the outcome of the UK elections, perhaps forcing them to reconsider their confidence in Theresa May (and their underestimation of Jeremy Corbyn); Mark, a down on luck attorney; Martin, the lounge car attendant with a cheery affectation; Kevin, a staunch Republican and Trump supporter, a native Oregonian who now lives in a small office somewhere in Hawaii, and apparently hasn’t paid the IRS since 1984 because taxes are “voluntary”; Mark from Des Moines, Iowa, who exclusively travels by train; Charles, from Kentucky, who is wanted in three different states; Bible-thumping John, who I didn’t ever speak with, but nevertheless commanded a presence: I often heard him speak with several people about Jesus; and several Amish people traveling from Lancaster, none of whom I got much of a chance to speak with. 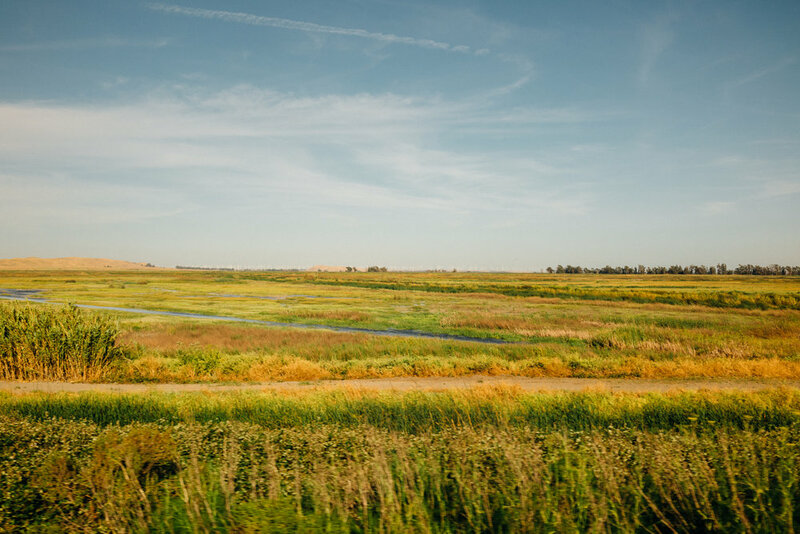 Living in New York, having just boarded the train in Chicago, on my way to San Francisco, it hadn’t occurred to me that the train traverses the conservative heartland of the country, until I was on the train. More than one person onboard said to me “you’re good, man, you’re good”. At first I simply smiled, but at some point Charles had said that to me several times, and I snapped. “You’re being racist”, I told him. I pretty quickly regretted saying that because I wondered if he might have a gun on him. I had just reacquainted myself with what must be fear. Despite the racist undertones that clouded my first interactions with some of the folks on board, further interactions were actually civil and moderately engaging, even if their arguments were – pardon my judgement – incomprehensible and severely lacking in perspective, and, perhaps because of it, empathy. The train starts in Chicago in the afternoon at 2:00pm. I had gotten myself a burrito from Chipotle for a late lunch, which I ate few minutes after my train, Amtrak no. 5, left Union Station, on time. The first couple of hours I kept thinking I’m on the California Zephyr! It felt surreal. After a quick stop at Naperville, Illinois, I fell asleep briefly before I woke up further west, past the Illinois-Iowa state border over the Mississippi, being hurtled into the corn- and soybean-field plains of Iowa. I wasn’t hungry yet when the light started fading. My earlier excitement at being on the California Zephyr took on a subdued character. Our coach attendant started taking dinner reservations; I got myself a seat for 8:30pm. 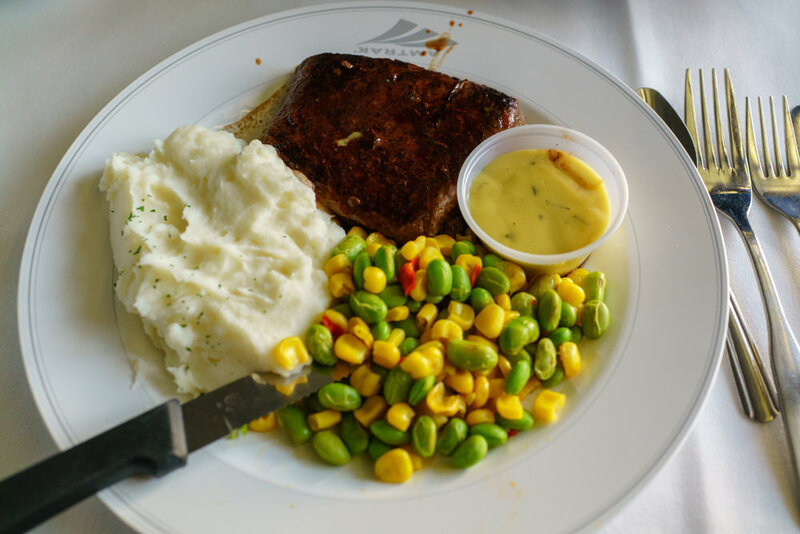 Amtrak’s dining car functions, for the most part, like a restaurant: you see a host or hostess to get yourself seated, you order from a menu, and you’d ask for your check when you’re done. What’s different, though, is that because space is constrained, if you’re traveling by yourself, you are seated with your fellow passengers. This is a nice opportunity to meet and talk to other people. My dining companion for dinner this night was Mark from Des Moines, Iowa, who exclusively travels by train, who was headed to Reno. At first I was seated next to Mark, but I moved across from him to give his large frame (and myself) some space. I asked for the “Thyme scented chicken breast with your choice of a chunky tomato salsa or a warm red pepper sauce (based on availability). Served with mashed potatoes and vegetable medley.” Small talk ensued, with the hint of politics hovering around, but never quite fully making it the object of conversation. I was thankful. Dinner is served: Thyme scented chicken breast with your choice of a chunky tomato salsa or a warm red pepper sauce (based on availability). Served with mashed potatoes and vegetable medley. Coach seats on Amtrak are like economy seats on airplanes, but with much more legroom and wider seat recline. They are quite comfortable, but 52 hours on it can be a little too much. My mornings usually started with a trip to the bathroom downstairs. I’d then go back up to my car, fill my water bottle with water from the water fountain, walk across to the lounge car and head down where Mark sells coffee, snacks and microwavable foods. It’s too early for the café car, so I get some coffee and head back up to the lounge car. I like sitting by the chairs that face the window. My gaze alternates between looking out, watching people, and reading Elizabeth Anderson’s paper, What Is the Point of Equality?, where she seems to espouse Martha Nussbaum and Amartya Sen’s Capability Approach to equality. It’s quite the juxtaposition to a room filled with people whose approach to egalitarianism ends at “every man for himself”. We are past Nebraska and now in Colorado, heading towards the Rockies. It’s 8am as the train arrives in Denver. I head to the dining car for breakfast – unlike lunch and dinner, served on first come first served basis – where I’m seated with Bob and Margaret, retirees from Newcastle who are traveling with their friends Brian and Margaret. Both Margarets have known each other for over 50 years. They were headed to San Francisco where they’d spend a couple of days, before setting sail on a cruise. I quite like the Creole Scrambled Egg Bowl, even if my scrambled eggs weren’t exactly scrambled, while our conversation drifted toward talk about the impending elections in the UK. Both Bob and Margaret sang the praises of Theresa May and they both thought (but Margaret in particular) that Jeremy Corbyn was a joke and there would be no contest. How wrong they’d turn out to be. 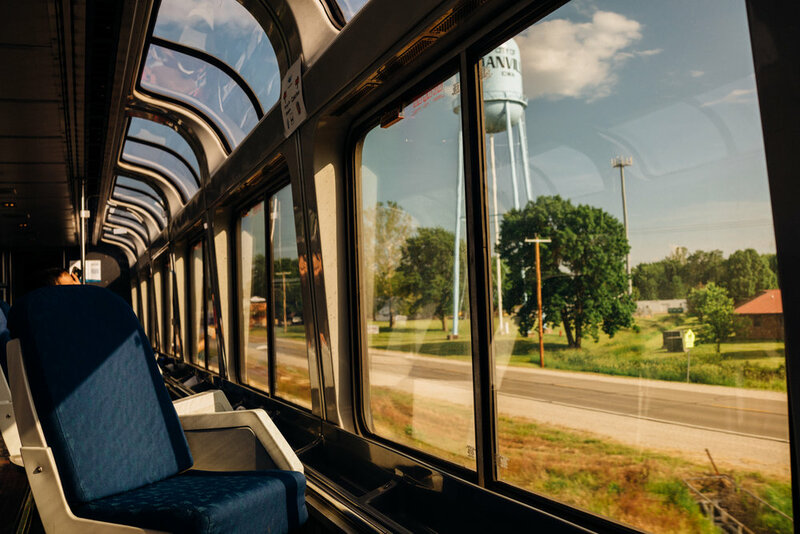 The lounge car is now prime real estate, so now is a good time to find yourself a spot. The most dramatic scenery is about to begin as the California Zephyr begins its (unusually) slow, gentle climb up the Rockies. 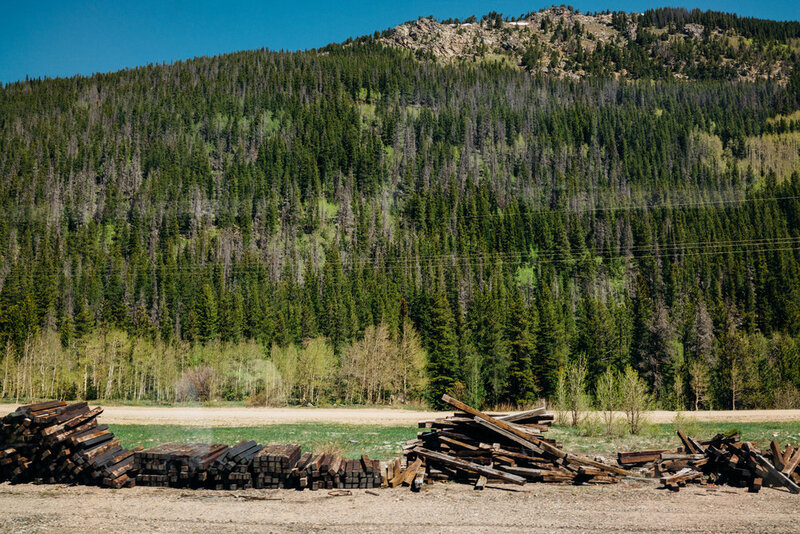 If you’re riding the train in the warmer months, you might see a curtain of green pine trees over the slopes interspersed with what looks like specks of purple. This happens when Buprestidae, a kind of wood-boring beetle, feeds on pine trees during droughts. Another curiosity on this stretch of the ride was the rafters on the Colorado River “mooning” us as we rode by; we normalized this curious exhibition rather quickly and would become surprised when someone didn’t moon us. After chatting with Bob and Margaret some more I headed back to my seat for some alone time. I returned a couple hours later for lunch. My seat mate this time was Charles, the fugitive from Kentucky. 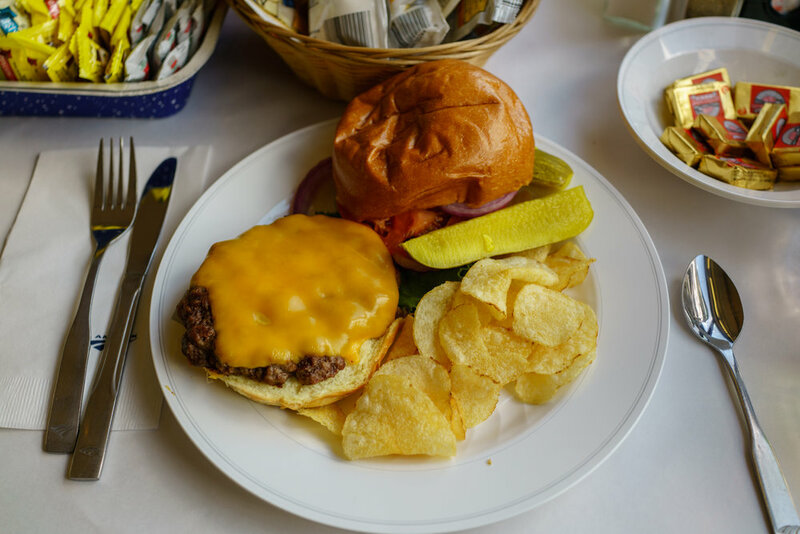 Like pretty much everyone else at my table, I quietly ate my Natural Angus Burger, while Charles, annoyed that the dining car attendant refused to serve him alcohol (reasonably so), rambled on. The food on the Amtrak, while nothing special, ain't bad at all. Our train was moving at snail’s pace for a while because of signal problems ahead. We should have been in Grand Junction, Colorado by now but it wasn’t to be for another three hours. I went to the lounge car to drink some coffee and pore over Isaiah Berlin’s Liberty: Incorporating Four Essays on Liberty, an admittedly poorly chosen book for lounge car reading. I happily took a break when Ruby Canyon appeared in front of the windows, later followed by a rather anticlimactic sign indicating the Colorado/Utah state line. Later that night I shared dinner with a Norwegian couple, and a machine learning engineer at Eventbrite who decided to take the train to attend Spark Summit in San Francisco. I decided to splurge and ordered the The Amtrak Signature Steak, our conversations lingering around the transformative power of technology. I would have liked to drink a cold beer this night but I was starting to feel a little sick, unfortunately, my throat increasingly becoming scratchy. When I woke up next morning we were tearing through the arid landscape of Nevada. This morning my breakfast-mates were Oregonian native Kevin and his sister. Our convivial smalltalk swiftly transformed into a heated debate when we realized our political views were rather different. Our conversation began with the debate around school choice, which attracted ears from neighboring tables. This later turned into a stalemate around immigration policies. The scale at which policy decisions are made are complex enough that it felt a little naive to me that we were debating any of this at all, each of us armed with our preferred sources to back us up. It also occurred to me that righteousness and morality aren’t universal and can be viewed from as narrow a lens as possible or as wide a lens as possible. The conservative sense of family, ironically, extends as far as the individual. Kevin’s sister left us to continue our chat, which we took to the lounge car. Despite our disagreements, our conversation remained civil. Kevin even invited me to visit him in Hawaii. We arrived at Reno, Nevada around noon. I took a stroll outside the train to get some fresh air in the hot desert sun. At this point it had been well over 40 hours on the California Zephyr. It seemed like a lot of us were ready for this to be over, but many of us had over 10 hours to go. For lunch I had the Natural Angus Burger again, sharing my table with an herbalist who was heading to Martinez, California. 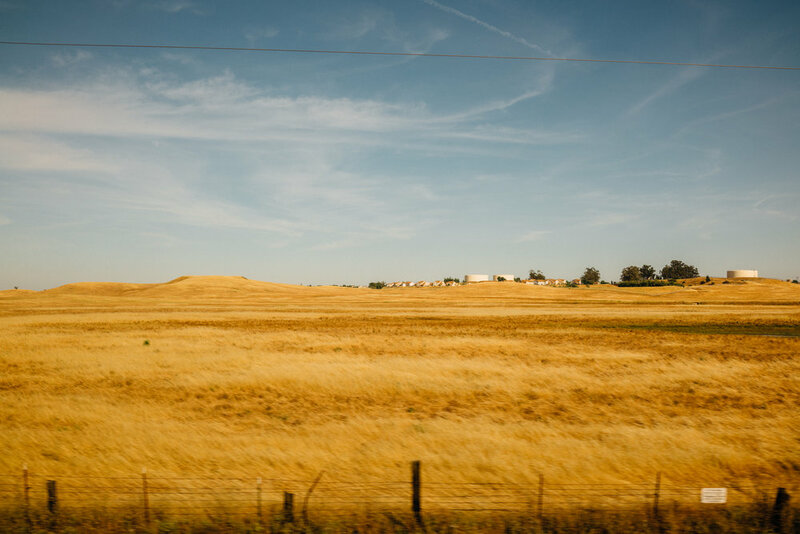 The hours after were a blur, the coach visibly lighter in load, but with a palpable unrest, the uninspiring agricultural California landscape passing us by. The California Zephyr finally arrived in Emeryville station at around 7:15pm. Everyone’s sullen faces lit up with respite. I hadn’t been in California in over five years. Stepping out of the station, the cool Northern California air on my face, I was giddy with excitement and anticipation. I called myself a Lyft to head to my friend Raj’s home in Alameda. I couldn't wait to sleep flat.